What should I do with my art??? I think it is important to realize that the way you mount your painting contributes to the beauty of your art. Some people will argue that the mounting and framing constitute more than half of the aesthetic and monetary value of a piece of art. While I don't think a bad piece of art can be improved much with a nice frame, a bad frame job can ruin the presentation of an otherwise wonderful piece of art. And of course, a great piece of art with a great frame and matting multiply the beauty of the whole presentation. One thing that is unique about Chinese art is that most of the time, paintings that are intended to be framed (as opposed to ones intended for scroll mounting) are often square in shape. This is a little different from western artists whom often use rectangular-shaped canvases. If you go to an art store, you will often see many rectangular frames, but very few, if any, that are truly square in shape. So I want to give some ideas for how to mount and frame your art. 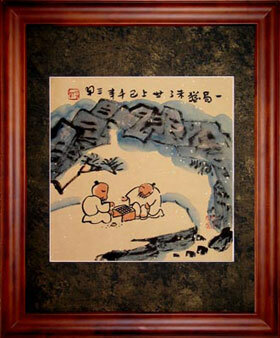 Keep in mind that if you buy a piece of art from us that has a traditional Chinese silk border / matting, you can use this as your matting, and just have your professional art framer build a custom frame for you. If you are wondering what this might look like, most or our that that are mounted to silk have a simulated frame in the website art item listing to roughly show you how it might look. The benefit of professional framing is that you get a well-mounted art presentation with a frame that matches the shape of your art. The down side is that professional framing can often cost more than the cost of the art itself. Please note that I recommend telling your professional framer to "dry mount" your artwork to the backing board of the frame. This is a process of bonding the artwork using a vacuum press. This will virtually guarantee a wrinkle-free presentation of your artwork for many years to come. If the painting's border width is 24" (60cm) or less, you can use a standard "off the shelf" frame from your local art store, and just have some matting of your choice cut to fit your painting. In the states, you will be able to find many frame styles at a reasonable price at places like Aaron Brothers, or Michaels, or your local art supplies store. They can also cut the matting for you. Always have the matting cut at least 1/4 inch smaller than the actual size of the painting. You will need just a little overlap so that you can properly mount your own art behind your matting securely. If you are getting a piece of art (such as our philosophy art as pictured below) which has a size of 12½ or 13 inches, a standard 16 x 20 inch frame will do a great job. I spent many hours writing and taking pictures for a "How To Frame" webpage for those who wish to mount their art in standard frames that are available in the USA, Canada, United Kingdom, and metric equivalents many other countries. I hope it helps you out. Above is an example of a 16" x 20" frame with one of our philosophy art pieces. The matting shown is a standard 16" x 20" piece with a 12¼ x 12¼ square hole for the painting. This gives a very nice presentation while remaining very economical. You can probably find a solid wood frame like this for $20-$30 and the custom cut matting should cost just over $15 if it is cut for you (if you have never cut matting before, trust me, have a professional do it).